That sentence, from Mike Sula’s Food Chain post on the recently-opened Dawali Mediterranean Kitchen last week, initiated a serious craving for good lamb shawerma. We went to Dawali for dinner last night, and the cautionary praise proved true. We ordered the Shawerma “from the grill”—a plate of beef and lamb shawarma on top of buttery basmati rice—falafel, hummus, tabbouleh and a side of olives. All proved to be solid choices. The dish that started the mission—shawerma—was a B or B-, served on the dry and warmish side, and lacking in the hot, crispy, charred and fatty bits department. The lamb shavings were tasty, but with too much chewy beef in the mix to make it legendary. 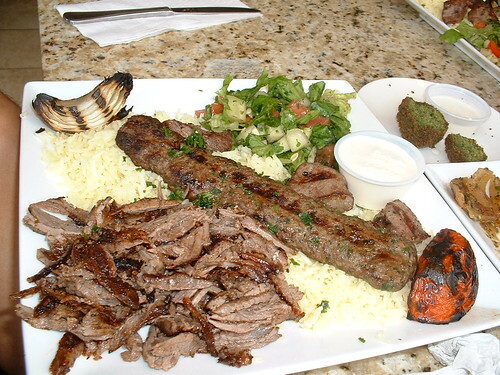 We had ogled the stack of fresh, glistening shawerma spinning on the Autodoner as we ordered, but the pile we were served had been sitting, pre-shaved, on the grill in the back. Not the worst of sins, but a disappointment…which we remedied by ordering a second, additional side of “freshly cut shawerma”. The second batch was better in every way—with enough hot, crunchy, fat-streaked lamb in every bite. But I’m still not a fan of beef in shawerma. Hummus and tabbouleh are peak-fresh. The creamy hummus surrounds a moat schlicked with a tangy lemon, olive oil, sumac and flecks of a green herb I couldn’t ID. 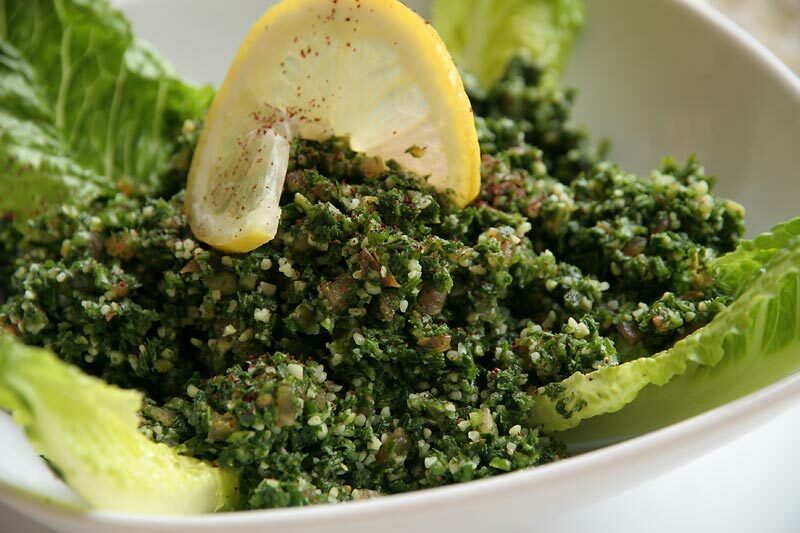 The tabbouleh was biting-sharp and the definition of the flavor “green”. 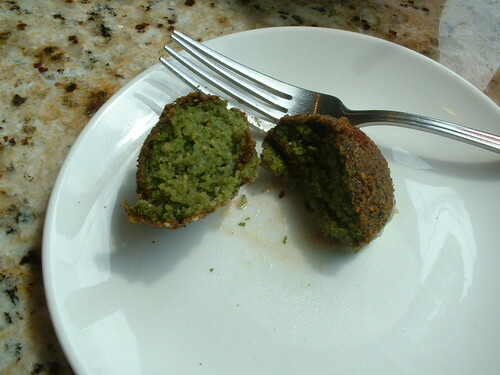 Falafel were exactly as they should be—crisp-hard shell with a tender middle—and had an unusual kick. The olives? An interesting medley of small, pitless black olives, little disks of pickles and half-moons of the shocking-pink pickled radishes you get in Korean and Japanese restaurants. I’m going with a side of feta, or qudisya (a blend of hummus and ful mudammas) next time. Dessert: House-made baklava was paper-y crisp, nutty, sweet and delicious--not at all the typical afterthought of chewy, dense and overdone sweetness. Mamoun’s Restaurant in NYC—where lines of worshippers snake out of the shoebox-size restaurant 24/7 for pitas and plates piled with the freshly-shaved meat. If you know of such a place here in Chicago, let me know. Until then, I’ll be going to Dawali, and asking for shawerma fresh off the spindle. My jaw dropped when I read this. I haven't been to Diwali yet so I can't comment....but to hold Mamoun's up as the standard-bearer for good shawarma is sacrilege. Slimy meat, rarely cooked beyond a pallid medium rare, all chewy and gooey served by gruff goons who don't understand a word of Arabic. Not good shawarma. The only reason people line up outside of that place is because it's on McDougal St. and they are drunk. I've had better shawarma in Phnom Penh for Allah's sake. And don't get me started on their falafel. If anyone wants good Shawerma in NYC is suggest heading elsewhere. No offense to you, maybe our tastes differ, and if I am being hyperbolic in my disdain its only because thats how I argue . But if someone is planning on opening a place like Mamoun's I will be the first guy with waiving a picket sign around in front of the place. For shawarma in Chicago go to Salaam, or Khaymieh, or Semiramis on Kedzie, or Al-Ameer on Harlem and 111th, or Uncle's Kabob on Devon. Habibi wrote: If anyone wants good Shawerma in NYC is suggest heading elsewhere. And, I will stand my ground...I've never experienced the undercooked, pallid meat you describe, and those "gruff goons" are understandably not as cheery at certain hours when, indeed, half of their clientele is drunk. This is the sandwich--at 4 a.m., mostly sober--that made me love New York. I agree that the rest of MacDougal is food abomination, but Mamoun's is the exception. Could timing be the issue? Admittedly, it has been a few years since I've had one on a regular basis. When was the last time you ate there? Let me repeat--because I, too, want to be clear. The shawerma I have had at Mamoun's has always been tasty, crispy, fatty, all-lamb shawerma, and it makes me want to do a little shawerma dance just thinking about it. Rest assured...I will be trying your Chicago recs. to see just how far apart our tastes are. I want all lamb. No beef. No stinkin' gyro. Most of those Chicago recs are well-vetted and well-loved here. I concur, especially with Salaam. Not sure if it meets the all-lamb requirement. I only have one or two recommendations for Shawerma in NYC because unfortunately, most of what I have had there was rather disappointing - more fat than meat in some cases, dry as bone in others, and always lacking spices! Maybe this is how they like their shawerma in NYC, and if it's fresh and cooked to a crisp, the fatty stuff can be great. The problem that I have with Mamoun's is that I have never had a good shawerma there. Never. And the falafel tasted more of old grease than cumin or parsely. Maybe Mamouns is good some days, so I will leave that issue alone. As for the recs - I regard Black Iris and Zaytoon's in Clinton Hill as serving a decent shawerma. Of course, those places are outside of Manhattan. Sana'a on Atlantic Avenue in Boerum Hill (Brooklyn again) does a pretty good job also. One would do well to wander around Bay Ridge in Brooklyn or Steinway Street in Astoria to find other, possibly superior stuff. Having lived in the Middle East and NYC (but a Chicago native first! ), I think there are differences between Chicago Middle Eastern and New York Middle Easter. NYC beats us hands down when it comes to Yemeni. I still dream of the lamb shank at Yemen Cafe on Atlantic Ave....many places (like Zaytoon's, Iris, Sana'a, Bedouin Tent) even bake their own bread in house - a rarity if not impossibility in Chicago Arabic joints. You will also have a much easier time finding merguez and other North African delights. What we do better are the following - falafel, hummus and in my opinion, shawerma. This could be because most of the ME restaurants in our beloved town are Palestinian or Lebanese. I can't comment on the beef/lamb issue, but I do know that our stuff is more consistent, better spiced (nutmeg, cinnamon - the key ingredients in baharat) and generally better cooked. You can even get shawerma on a roll (taboun) at our many Assyrian/Iraqi joints (something I have never come across in NYC). Oh and Ccrush, if you really want lamb fatty goodness then you need to try Orchid Cafe on Addison and Lincoln, the new Turkish place. Homemade doner, so lamby, so fatty, and cooked to a crisp. It's not shawerma, but it is magnificent. I tried Dawali tonight and was generally impressed. Beef shawarma was pretty tasty, albeit a little dry. A falafel sandwich featured lukewarm, slightly dry falafel. But then a second order of falafel was freshly made for us and was perfectly crisp on the outside and featured a tender and moist interior. The falafel was very tasty and strangely, it delivered a bit of a spice kick . . . which I liked quite a bit. Overall, I'd say it was one of the better falafels I've had (the freshly made ones that is). Baba ghanoush was well done and the chicken kabobs with rice offered nicely seasoned and moist chicken, beautifully charred onion and tomato and your standard basmati rice which was a bit dry. The friendly staff treated us to a couple desserts -- baklava and a semolina cake drenched in a honey syrup and topped with an almond (basbousa). 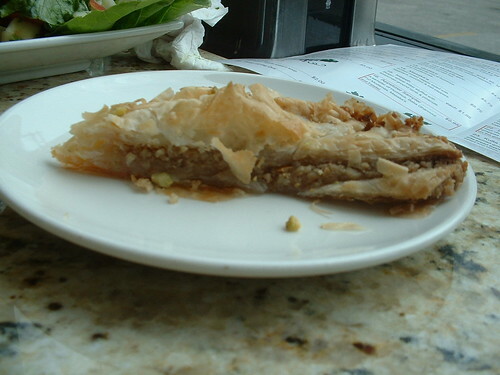 I agree that the baklava had a great texture -- maybe a bit strong in cinnamon(? ), but still nice. The semolina cake was very moist and pretty tasty. JeffB wrote: Most of those Chicago recs are well-vetted and well-loved here. I concur, especially with Salaam. Not sure if it meets the all-lamb requirement. Salam is one of my all around favorites, shawarma is beef and lamb. Al-Khaymeih shawarma is all beef, Semiramis shawarma is beef and lamb. Dawali's shawarma is beef and lamb and, as of today's lunch, deliciously full flavored, crisp edged with a lemony note. Habibi wrote: Oh and Ccrush, if you really want lamb fatty goodness then you need to try Orchid Cafe on Addison and Lincoln, the new Turkish place. Homemade doner, so lamby, so fatty, and cooked to a crisp. It's not shawerma, but it is magnificent. Yes, this is what I seek. I don't care what you call it...doner, shawerma. I just want all lamb. I'm probably wrong, and don't have the experience you have eating in the Middle East, but I thought shawerma was, by definition, either all lamb, or goat, or chicken. Beef is, well, my beef with the shawerma I find here. I don't like it in the mix--it changes the flavor, the texture, and IMO, is partly to blame for the dryness. In last summer's 'best sandwiches' roundup in TimeOut Chicago, a place in Marquette Park called The Nile (on 63rd St., not to be confused with the one in Hyde Park on 55th), served the "best shawerma." The one time I made it there, they were out. Your recs., and The Nile, are on my list of places to visit over the coming weeks. If you'd care to join in on a lunch or dinner...and maybe we can thumb-wrestle over 'best shawerma, nyc'. I look forward to my next trip to the city to try your recs. crrush wrote: In last summer's 'best sandwiches' roundup in TimeOut Chicago, a place in Marquette Park called The Nile (on 63rd St., not to be confused with the one in Hyde Park on 55th), served the "best shawerma." 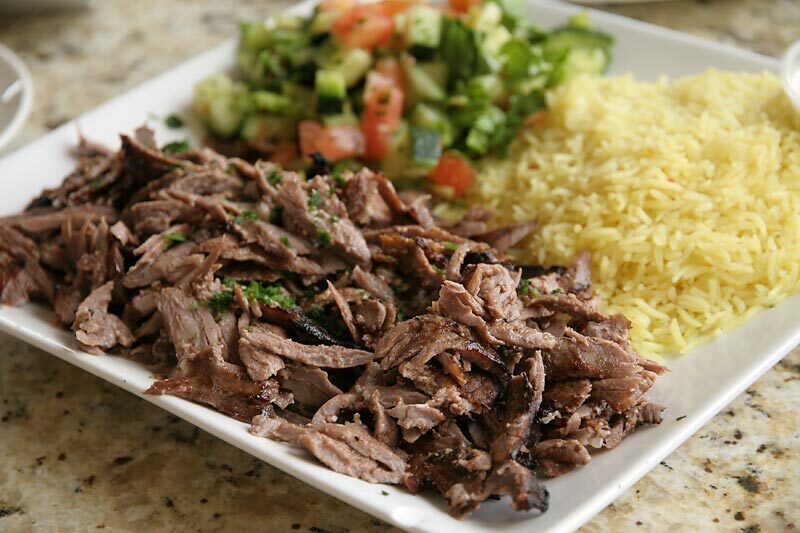 The Nile on 63rd serves a beef lamb shawarma mix, as does Steve's Shish Kabob in Palos Hills. The closest all lamb shawarma I know is Cedarland in Dearborn Michigan. Intrigued by Mike Sula's Food Chain post and crrush's account of her visit, I had lunch yesterday (accompanied by GWiv) at Dawali Mediterranean Kitchen. Dawali is not your run of the mill Kedzie Avenue shawarma joint. Although the decor closely resembles that which you might find at Pita Inn (light colored stone tables and clean as a whistle), the food is more akin to a place like Wholly Frijoles or GNR Winner Casa de Issac in that is is a good representation of the native cuisine cooked with the deft hand of a trained chef, rather than someone who is a skilled cook but has had no formal culinary training (typical of most mom & pop places). Tastes and spicing are subtle, rather than heavy handed or rustic. If someone was new to middle Eastern food and/or was a bit squeamish, Dawali would be a great place to start the exploration of this fabulous cuisine. I got the impression that Dawali is targeted at families and the nearby North Park College student population rather than strictly the primarily male Arab diners, who might prefer a more rustic place such as GNR Winner Salam. Our lunch started with the appetizer platter. 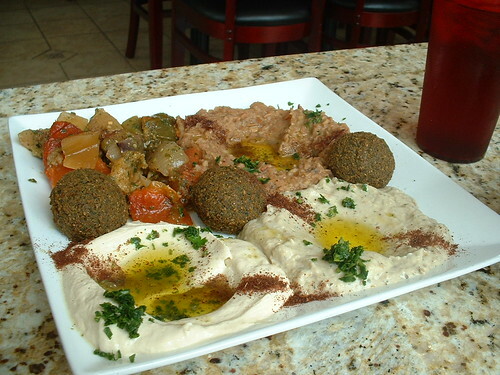 The platter featured 3 fresh-from-the-fryer falafel balls as well as generous servings of 4 salads. The falafel were very good, the hummus was very creamy and had a straight ahead flavor without very much garlic or lemon (although the delicious oil spiked with specks of mild jalapenos made up for any perceived lack of flavor), the baba ganoush and foul were OK, but the real standout was the masaka'a (grilled/stewed veggie salad), which was something I will be returning for again and again. Next up were a couple of made in house snack-sized pies. The first, Jibin (haloumi cheese with a touch of mint) was perhaps my favorite food item of the entire meal (I'm a sucker for melty cheese). The combination of the cheese along with the delicious house made pastry makes this a dish that hits on all cylinders. Jibin will be a part of my order every time I visit Dawali. 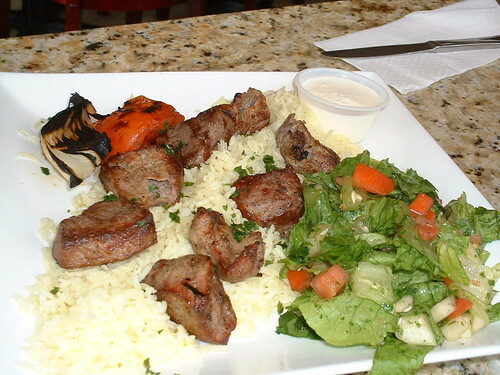 The Kifta Kebob plate is served with yellow rice and nicely grilled veggies. Though cooked over gas rather then charcoal, the kifta still had a very good taste, showing the skill of the chef in marinating and spicing the kifta. As mentioned elsewhere, the beef and lamb shawarma is top notch, with a fairly aggressive rub of spices that adds some good flavor to the crispy edges. We rounded out our lunch with a couple of the house-made desserts. The semolina cake they serve is lighter and less dense than versions I have had elsewhere on Kedzie and really shows off the deft hand of the baker, and the baklava was equally light and not overly sweet as this dessert can often be. The staff (The owner/chef and his niece when we were there) couldn't be more friendly and accommodating. This alone sets Dawali apart from many of the more rustic places on the Kedzie strip, which can be a bit intimidating to the uninitiated. While Dawali probably won't become my default destination for Middle Eastern food, it will certainly go into the rotation and I'll be visiting often. Thanks for the thoughtful posts and information. This board has (and has had) a number of experts regarding specific cuisines, whether Italian, Thai, regional BBQ, regional Indian, Pakistani, Cajun, etc. For me, the value this board provides in educating my palate and revealing worthwhile restaurants in Chicago and beyond is tied directly to posters' specific knowledge and their generosity with that knowledge. I'm not sure that Devon would be so well explored and appreciated (in general, and not just in this forum) if not for Zim, Athena, c8w, for example, or that the depth of Chicago Thai would be known, even at the most superficial level, but for Erik M.
Keep it coming. Middle Eastern is an area that deserves more in depth discussion. Argue with me, kick me, beat me up, say that I'm crazy . . . but Dawali's falafel are the best in Chicago (Yes, Salam is cheaper, but cannot compare in taste). The seasoning is absolutely perfect, at least in part due to the extra kick from cayenne pepper. I have not asked but I assume that the filling is mostly, if not exclusively, favas. And the sandwich comes in an overstuffed pita which is also filled with some grilled eggplant, cauliflower and potato (they told me that this was a more traditional preparation, but I have no idea). I smiled at the side cup of Sriracha sauce, but they swore to me it was as close to the taste of the hot sauce they grew up on (don't worry, there's also tahini). In any event, be it traditional or not traditional, I don't care -- Dawali's falafel sandwich is fantastic and will have me returning there on a weekly basis. BR wrote: I have not asked but I assume that the filling is mostly, if not exclusively, favas. I have asked, and the falafel are chickpea, not fava. 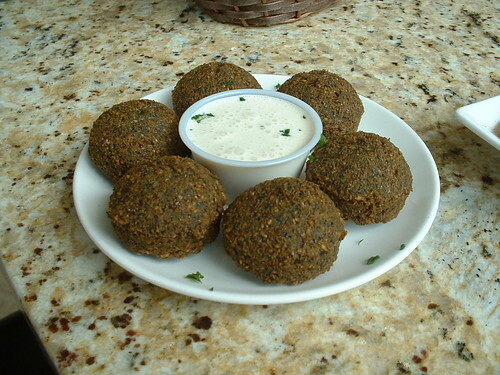 But I agree, Dawali's falafel has some of the moistness/depth I associate with fava bean falafel. G Wiv wrote: I have asked, and the falafel are chickpea, not fava. I don't know. They do have an interest in not letting people know how they make it. gp60004 wrote: I don't know. They do have an interest in not letting people know how they make it. I've talked with Dawali chef/owner Nasser Amer, a graduate of Kendall Culinary and former Ritz employee when Sarah Stegner was at the helm, at length and if he was dissembling for the sake of 'protecting' his recipe I'd be extremely surprised. Yes indeed Gary -- I was there last night and they told me all chickpea (not that I didn't trust you ). They indicated that fava is more of an Egyptian flavor. FYI - I had lunch at Dawali yesterday and found out that they now deliver for a $3 charge and a minimum $15 order. I'm not sure about their delivery zone. As for the food, as good as ever . . . my favorite falafel (the classic falafel sandwich which comes in a pita also stuffed with roasted vegetables - potato, eggplant and cauliflower), a very good and smoky baba ghannouj and their always very tasty beef and lamb shawerma. Amen. We had their classic falafel sandwiches tonight (with a side of baba ghannouj) and the falafel were outstanding - hot and freshly made, crispy outside, light, flavorful interiors, the eggplant, cauliflower and potato were great. And my pita bread was soft, but didn't fall apart. The hot sauce on the side looked more like fresh chili sauce tonight and that works, too. Their hospitality was warm and generous with a complimentary piece of knafeh. That dessert was new to me, baked shredded filo dough with cheese and a simple syrup. Not too sweet, but light and just right. We'll be back. There are so many choices on Kedzie that I have always found myself torn in terms of where to dine. But Dawali has absolutely surged to the very top of my list as its high notes just keep getting higher and higher - to the point where I visit Dawali at least once every two weeks and now infrequently visit my usual faves, Salam and Semiramis. Tonight's dinner was outstanding as usual so I felt like showering Dawali with more praise. The beef/lamb shawerma is excellent, and in my opinion better than it was in Dawali's early days, with guaranteed warm, moist slices with a perfect mix of crisp edges. The flavor has always been excellent with nice spice and citrus flavors. Dawali's classic falafel sandwich (as opposed to their regular falafel sandwich) features grilled vegetables (eggplant, potato and cauliflower) in addition to the very best falafel you will find in Chicago. 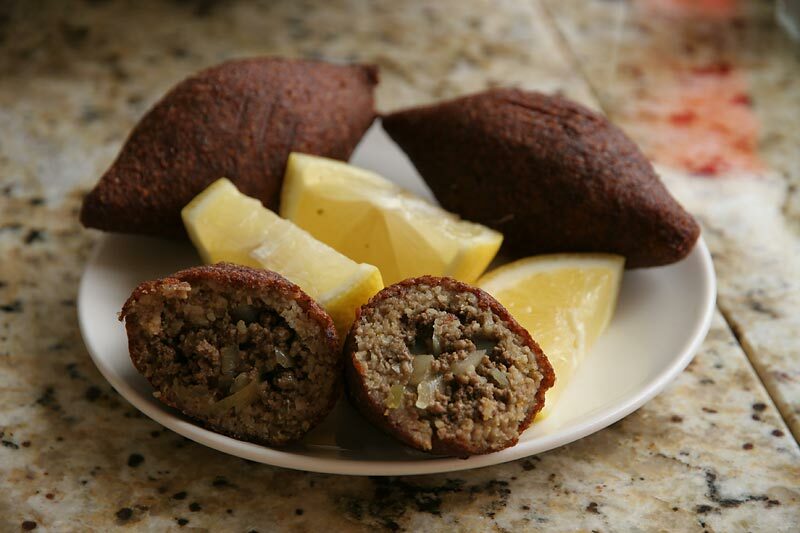 The kibbeh tonight was perfect - hot, crisp, moist interior and beautiful flavors from the lamb and pine nuts. Baba ghannouj is always another must for me, offering just the right amount of smokiness from the charcoal cooked eggplant and a drizzle of olive oil. It's served with always fresh pita, pretty much guaranteed since they are next door to the Pita House. Fattoush and tabbouleh are always top notch, although I do prefer the fattoush at Semiramis. Beef, lamb and chicken kabobs (I haven't tried the shrimp kabobs) also are excellent and include rice and nicely roasted vegetables. I am also a big fan of their bread pies. Free drink refills are a plus, but the very friendly and accommodating staff make me feel even better about frequenting the place. On a recent visit, they mistakenly gave me a regular falafel sandwich when I ordered classic, and were so apologetic when I mentioned the problem and brought me a complimentary piece of the very tasty semolina cake. For those of you who frequent Salam, Semiramis or other spots on Kedzie, but who have not paid much attention to Dawali, I highly suggest you give this place a try. It's an absolute gem which should not be missed. And if you go, my first recommendation would be the classic falafel sandwich, my favorite order at Dawali. 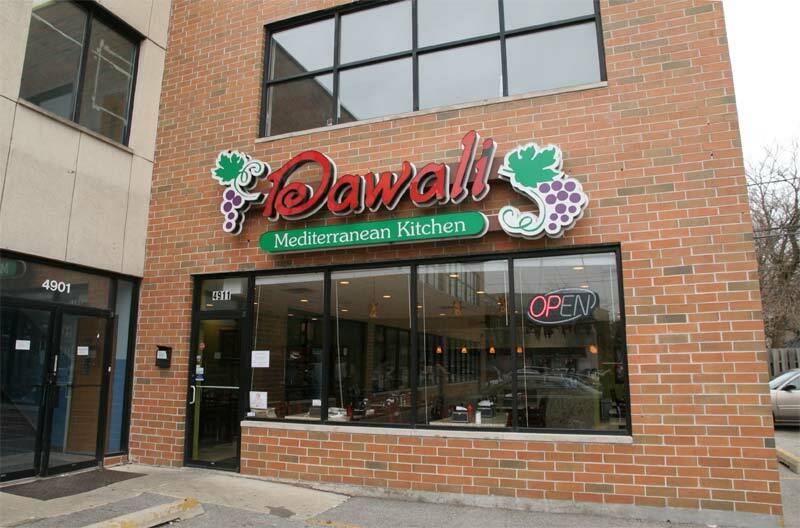 BR wrote: For those of you who frequent Salam, Semiramis or other spots on Kedzie, but who have not paid much attention to Dawali, I highly suggest you give this place a try. It's an absolute gem which should not be missed. Was on the say to Salam yesterday and remembered your post and called an audible. It's been a while since I've been to Dawali, liked it in the past, but they seem to have stepped up their game. Clear clean bright flavor, lighter, a little more refined. 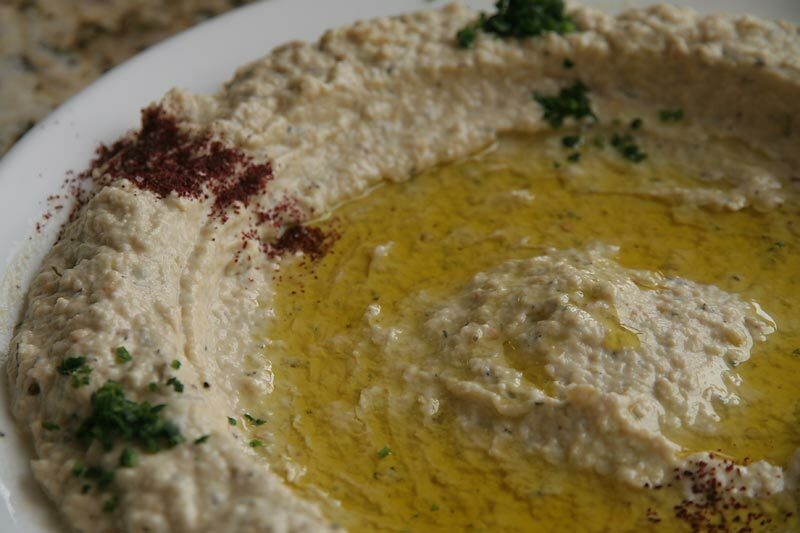 Hummus is exceptionally light and smooth, Nasser, the genial owner, deskins the chickpeas, served with a pool of lemon juice enhanced olive oil. Crisp greaseless falafel, moist, herbal with a chili pepper zing. Small chopped salad, fresh, crunchy, lightly dressed and warm pita rounded out lunch. Shawarma looked great, beautifully toasty exterior, moist interior. I chatted a bit with Nasser, talk turned to other restaurants and he pulled out a take out menu saying a customer had highly recommend 'this place' Once glance at the menu and I had my suspicions it was BR, after all who but an LTHer walks around with Sun Wah take out menus in their pockets. Glad to hear you enjoyed Dawali as much as I do. Funny thing is, yes I have a Sun Wah take-out menu - 2 in fact. I keep one in my car and another at home (and of course I keep the BlackBerry on hand so I can look at LTH pictures of Sun Wah items I might not have tried. And yet, it must be another LTH'er (or should be LTH'er) who supplied Nasser with the Sun Wah menu. Otherwise, I'd be missing one of my two menus. Hello everybody! 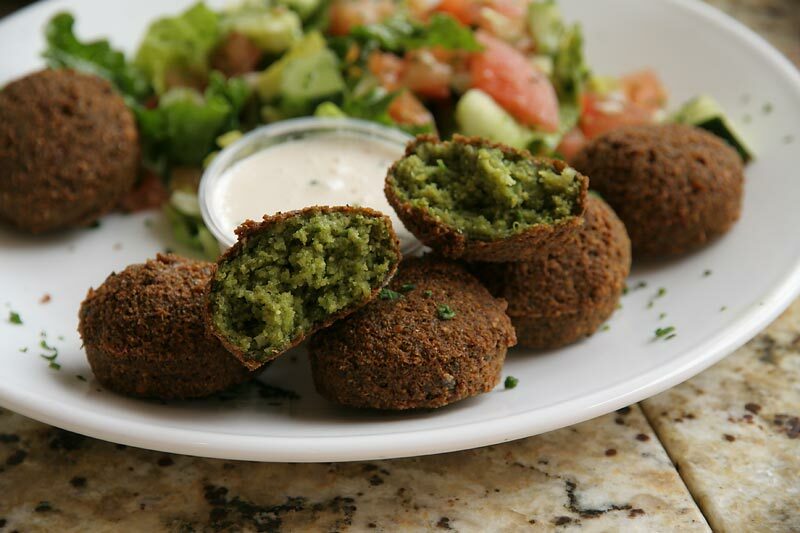 Just read the Redeye and Dawali is in the running for best Falafel in Chicago!! I couldn't agree more! Here is the link if anyone is interested! Go Dawali!!!!!!!!!!! Paid my first visit to Dawali today for lunch and will definitely be going back. The food was delicious and the owner was very friendly and courteous. As good as advertised. Freshly fried crisp, and very moist interior. The hummus was spot on, the ful was alright, and the baba ghannouj was a little too smokey for my taste...but I agree with stevez that the masaka'a is awesome. It's menu description of a grilled mixed veggie salad doesn't do it justice. Also, you gotta love the olive oil tossed on top of everything. The standout was definitely the cucumber yogurt and the fattoush was good too. The olives went missing in the village salad, but I loved the feta that was used. It was a lot softer (fresher?) than the really dry and crumbly stuff I'm used to getting. Nicely charred on the outside but over cooked like most kababs I've encountered in restaurants. Can you order kababs cooked to temp? One of the highlights of the meal was the shawerma which was a perfect mix of crispy charred moist meat laced with the right amount of fat and a great cinnamon flavor. The kufta was also good, and was well cooked with a nice pink interior. The owner sent out complimentary baklava for the whole table, and I wish I could say I liked it but it suffered from being room temp. I like my baklava to be warm with nice crispy phyllo and although it had nice flavor it was kinda soggy and underwhelming. Overall it was a very enjoyable experience. Tasty food made with high quality ingredients, plated nicely and served in generous portions (I was stuffed by the time my beef combo came out). My must haves would be the shawerma, falafel and the cucumber yogurt salad. The sampler options are a great way to try out a variety of the menu offerings. While Salam is still my top pic, given a recent lunch Dawali is moving up the charts fast. Every time I go I seem to like it a little more, bright fresh flavor, nice presentation, personable owner, spotless with a wide array of interesting cane sugar soda, including Green River and Dr. Pepper. Dawali, count me a fan. Does anyone know what Dish meant when it said that Dawali "began full-service dinner about a month ago"? What changed, exactly? chezbrad wrote: Does anyone know what Dish meant when it said that Dawali "began full-service dinner about a month ago"? What changed, exactly? Yes, and I have to laugh. I am a bit of a regular at Dawali, and one evening I went in there with a friend and proceeded to the cash register to order as I usually do. A woman behind the register then said we should sit down and she'd take our order. She then brought us the same paper menus we've always used at the register and then she returned to take our order. This seems to be the most significant difference with the switch to the "full-service dinner" (they always brought the food out to you once you ordered) - I suppose they'll bring you refills on drinks, but since I've noticed that table service is a bit uneven for "full-service dinner" and since the soda fountain sits in the dining room, I've often continued to help myself in this respect. I noticed that they added a few entrees to the menu, but I have not tried them . . . not sure if this is also part of the so-called expanded dinner service . . . who knows. All of the above being said, I still think the falafel is the best in town and I continue to be a big fan of Dawali. After separate conversations with GWiv and BR on consecutive days about the place, REB and I finally decided to check out Dawali last night. Wow, were we thrilled. After several, recent disappointing meals at Salam, Dawali delivered everything that we've been missing. 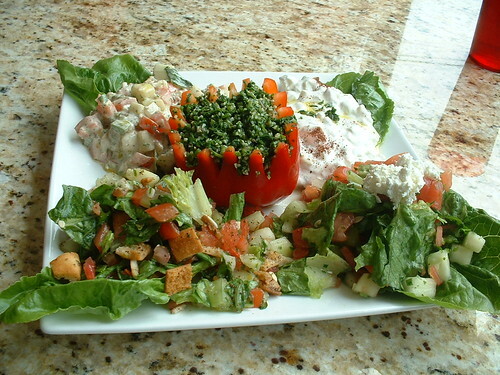 The salad sampler (pictured upthread) was massive, fresh, and delicious, despite the sad winter tomatoes. REB declared that we will be ordering this every time we go to Dawali, and that we will be going to Dawali often. On BR's recommendation, we tried the Classic Falafel Sandwich, which was spot on. Falafel balls were hot, crisp, fluffy, and beautifully seasoned. The roasted eggplant and cauliflower added some nice flavor notes. We also tried the hummus with diced lamb. The hummus was creamy as can be, and the lamb was tasty and tender. An unexpected highlight of this dish was that it was topped with a generous portion of very good, strongly flavored olive oil. Service was terrific. In fact, it was exactly like service used to be at Salam before the unfortunate expansion. What took us so long? Thanks to GWiv and BR for helping us find our new go to Middle Eastern joint. I'll add my thanks as well including RAB and REB as their recent post prompted me to suggest Dawali for lunch with a friend yesterday. We too had the salad sampler which is a huge and gorgeous plate as you can see from the pic upthread. Vegetables were crisp, fresh, dressed beautifully. We also ordered falafel and the beef shawerma with hummus. 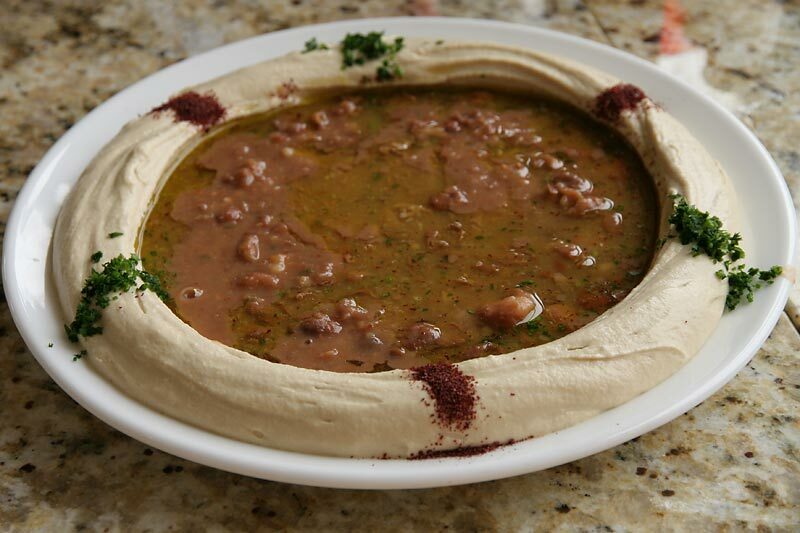 I think this may be the creamiest, smoothest hummus I've had in a restaurant in Chicago. The falafel were a little more dense and moist than other falafel I've had, but hot, fresh, crispy and well-seasoned. Our waiter and Nasser the owner were incredibly friendly and gracious. I'm looking forward to my next visit and to home deliveries as I was thrilled to learn I'm in their delivery area! Had a very nice inaugural lunch at Dawali earlier this week. We ordered a bunch of dishes, all of which I at least liked. Some, I loved. Even the dishes I didn't love were clearly prepared with care and quality ingredients. I haven't had this at a ton of places but this is probably the best kibbeh I've ever eaten. As with many of the dishes we had at Dawali, the seasonings were distinctive and intense, and kind of made me feel like I was trying it for the first time. Solid rendition, well-prepared and wickedly fresh but I didn't enjoy this as much as other versions I've had in town (and I can't really explain why). Both dips were terrific and yes, as others have posted above, the hummus is the lightest, creamiest rendition I can remember eating in Chicago. I also loved the mudammas, which was earthy and tart. I do wish we'd ordered these separately because as the lunch continued, I wanted hummus with some of the meat dishes and it was hard to separate it out. The mudammas, while terrific on its own, didn't pair quite as well with the meats. Not normally a fan of this dish, I thought this rendition was just outstanding. The texture was perfect. There was a pleasant amount of smokiness and the eggplant really came through from the front note through the aftertaste. This could be my new favorite version. Fantastically flavorful and juicy meats. 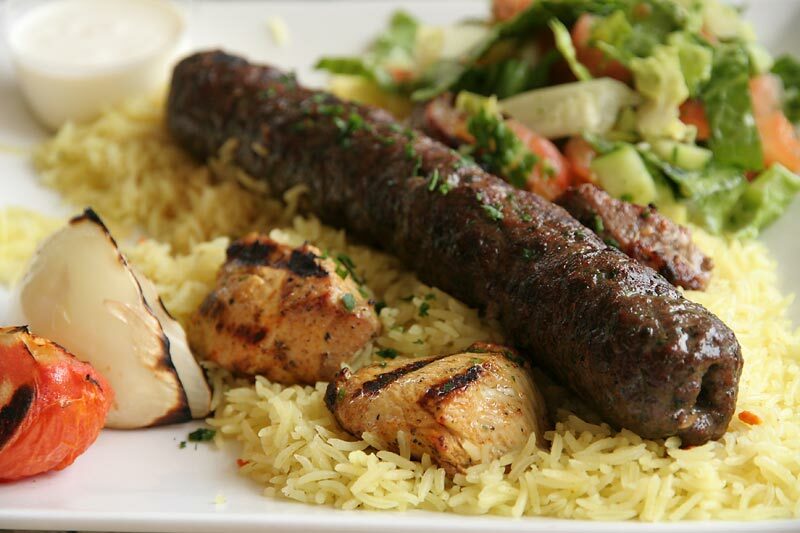 The beef kufte was well-seasoned and aromatic with a complex flavor. The kababs, both nicely marinated, were both excellent, too. I liked the rice and appreciated the 'individual grain' style but would have preferred it a bit more moist. Outstanding . . . even better than they look. Light, crispy, piping hot and intensely-flavorful. I loved everything about this dish except the flavor. The meat -- whole strips of beef and lamb -- was perfectly cooked. It was moist and had lots of nice crispy bits throughout but flavor here, by design, was very tangy and not my favorite style. Still, you have to give points for such a well-prepared dish, which I'm sure many will absolutely love. I really enjoyed our lunch at Dawali and can't wait to return. As I mentioned above, I didn't love everything but I completely respect and appreciate what they are doing. The care and quality here are clear to see. This is really great stuff, which should not be missed.